Late one night, alone in her car on her way to a friend’s house, Kimberly L was driving her 1999 Acura Integra on an Atlanta-area highway. As she headed south nearing the ramp for I-285, a tragic encounter occurred between Kimberly L and the driver of a tractor trailer. As the incident was originally reported, Kimberly L was accused of leaving her lane and crashing into the rear of the 18 wheeler. Kimberly L was thrown from her vehicle, sustaining devastating injuries. She was completely unresponsive when emergency workers arrived and took her to the emergency room at Grady Hospital. The commercial vehicle driver told police that he did nothing wrong, but that Kimberly L had crossed over the lane and hit his tractor trailer. As a result, Kimberly L was charged with causing the wreck. To complicate matters, it was discovered that Kimberly L’s blood alcohol level was just above the legal limit, and she was subsequently charged with DUI. When her family called Bruce Hagen, he immediately went to work on the case. First and foremost, the story that was on the police report made no sense. There was no reason that Kimberly would have been changing lanes in that area and every reason that the truck driver would have been merging. Bruce Hagen refused to accept the story that was being told by the truck driver and accepted by the police. Instead, he went to work mobilizing his team. In certain cases, there is power in numbers, and collaborating with the right colleagues can bring better results. Bruce reached out to a lawyer friend with a niche practice resolving complex tractor trailer cases. The two attorneys agreed to pursue the case jointly, combining forces on behalf of a worthy client. Gathering evidence was of critical importance. Kimberly’s legal team retained a well-known accident reconstructionist to investigate the physical evidence from the scene and to put together a reconstruction of the event. Studying gouge marks in the freeway, skid marks, the damage to both vehicles and other relevant details, the expert concluded that Kimberly’s car had been in the center of her lane and that the 18 wheeler has crossed in front of her from the fast lane. This gave enough support to justify a lawsuit against the truck driver and his employer. In the course of the legal team’s investigation, other facts were discovered that established blame on the part of the truck driver — and none on the part of Kimberly L Additionally, the attorneys were able to track down a witness that the trucking company tried to hide. That witness confirmed that it was the truck driver, not Kimberly L, who crossed over the lane and caused the incident. Eventually, all charges against Kimberly L were dropped. 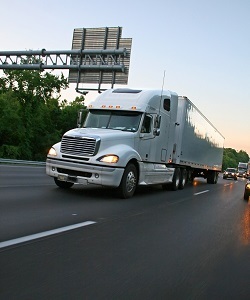 Due to pressure from her legal team, the trucking company’s insurer, after a long, hard battle, eventually agreed to a settlement that would provide Kimberly L with financial security. We are pleased that we were able to get Kimberly the justice she deserved, and happy to help such a great person. Please remember that if you have been injured due to the negligence of someone else, attorney Bruce A. Hagen is ready to help you. Contact us today to schedule a free consultation.